According to Todd DeZago- "One of Mike Wieringo's best friends and collaborators - "One of the great blessings that I've had in this life, is to have been great friends with Mike Wieringo. Not only friends, but collaborators as well, working on such characters as Spider-Man, Batman, the X-Men, and together creating the high-adventure, fantasy epic, Tellos. In bringing such stories--and worlds--to life, Mike used his unique style to illustrate worlds we WISHED we lived in. Sadly, Mike was taken from us all too soon, suffering a sudden heart failure almost two years ago now. Aside from getting to work with such colorful characters, Mike and I were also thrilled to meet and befriend one of our heroes, comics legend, Walter Simonson. Walt was one of the first to call me in shock and sadness upon hearing of Mike's death and was the first to offer his services (and talent) when Marvel Editor in Chief, Joe Quesada, and Dynamic Forces Head Honcho, Nick Barrucci, organized a tribute to Mike; an evening to honor him and to raise money for Mike's most passionate concerns, the ASPCA. Mike loved animals, adored them, and it is only fitting that these two pieces, so generously drawn and donated by Walt, should go to raise both funds and awareness for our wonderful four-legged friends." Walter "Walt" Simonson (born September 2, 1946) is an American comic book writer and artist. After studying geology at Amherst College, he transferred to the Rhode Island School of Design, graduating in 1972. His thesis project there was The Star Slammers, which was published as a black and white promotional comic book for the 1974 World Science Fiction Convention in Washington, D.C. (DisCon II). Some years later, he produced another version of the story in graphic novel form for Epic Comics, the Marvel Comics imprint that was a response to creator-owned lines of the early eighties. Simonson continued the adventures of the Star Slammers in a limited series in the mid-1990s as one of the founders of Malibu Comics' short-lived Bravura label. Walter's best known for his work on Marvel Comics titles in the 1980s and 1990s such as The Mighty Thor and X-Factor (the latter being a collaboration with his wife Louise Simonson). 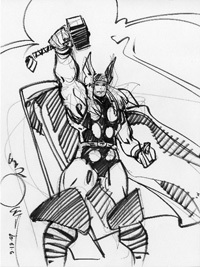 'Simonson took nearly complete control of Thor, during which he transformed Thor into a frog for three issues and introduced the supporting character, Beta Ray Bill, an alien warrior who unexpectedly proved worthy to wield Thor's hammer, Mjolnir. He started as writer & artist with issue #337 (Nov. 1983). 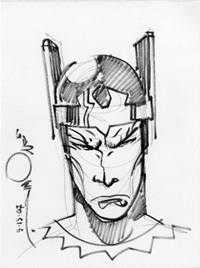 Simonson's run as writer-artist lasted until #367 (May 1986), although he continued to write â€" and occasionally draw â€" the book until issue #382 (Aug. 1987). If you can't afford to bid, please donate to: http://www.savedwhiskersrescue.com/donations.html or send a donation via paypal at: paypal@savedwhiskersrescue.com- It's a great cause!" "I'm so grateful to both Walter and Nick for their generous contribution. Saved Whiskers Rescue is a truly worthy cause. Walter's initial donation, now acquired and donation by Nick - well, the artwork is incredible! The funds from this auction will help us provide veterinary care and shelter for a few of the many stray cats and kittens that we come across, explained Pam Ott, President & Founder of Saved Whiskers Rescue. "This is a great opportunity for a lucky comic fan to own a one-of-a-kind piece of art and contribute to a dedicated and worthwhile cause like Saved Whiskers Rescue! Please be sure to view my other auctions as well."